Cosmo swung away again, deeper into downtown Athens. 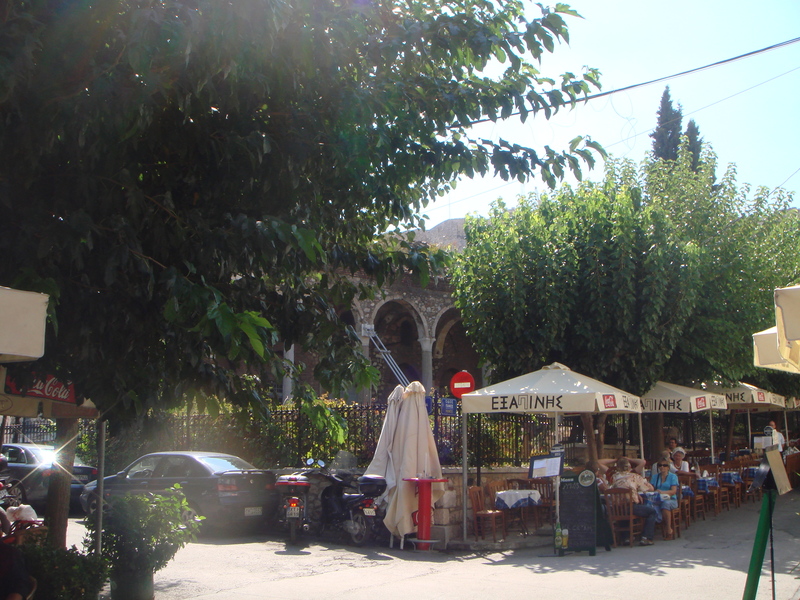 Monastiraki, where we came to rest, is a shifting, vibrant mix of tourists with day packs and runners and Athenians in their Sunday best. Architecturally, it is that blend of ancient, old, new and newer still, which makes up modern Athens. The Acropolis stands against the distant skyline, so the Golden Age of Greece is part of every Monasteraki vista. The last few columns from Hadrian’s magnificent library mark the time of the Romans. In the centre of Monastiraki Square is a beautiful little 17th century church, where black-clad widows, oblivious to the shuffling tourist crowds, pray and light candles to their icons. Nearby, an 18th century Mosque, from the time of the Turks, is now home to the museum of traditional Greek ceramics. A colourful bazaar, selling everything from reef sandals to amphorae, spills through its streets. Traditional taverna and coffee shops stand alongside pizzeria and fast food joints. Having delivered us safely into the hands of his friends in the restaurant on the corner of the square, Cosmo disappeared. But just like Cosmo, the friends knew what we would like and what would make us happy; olives, dips and pita bread, a crisp white wine, dolmades, Greek salad, soft, sweet Greek bread, moussaka, souvlakia, a tart red wine, coffee and baklava, according to custom, with the compliments of the house. Under the watchful and encouraging eyes of the waiters and chef we ate to a determined finish. But, then Cosmo reappeared and insisted on marsala for Madame and ouzo for Monsieur, with a little halva on the side.